Laure Nell Interiors was selected to inject a new life into this historic home, originally designed by Francis Abreu. Since he is revered for conceiving some of Fort Lauderdale’s most distinctive landmarks from the 1920s, Laure Nell Interiors took great care in restoring the home, selecting materials that honored the home’s legacy while also revitalizing the design. The husband is a musician, so the guest house sees lots of jam and recording sessions. A bold banana leaf wallcovering envelops the playroom, gold fixtures add a bit of jewelry to the bathrooms, and black-and-white encaustic cement tiles lend interest underfoot. While midcentury-modern furnishings fill the spaces, the children’s’ bedrooms take a more relaxed approach, with a floral bohemian aesthetic in one and a beachy look and feel in the other. 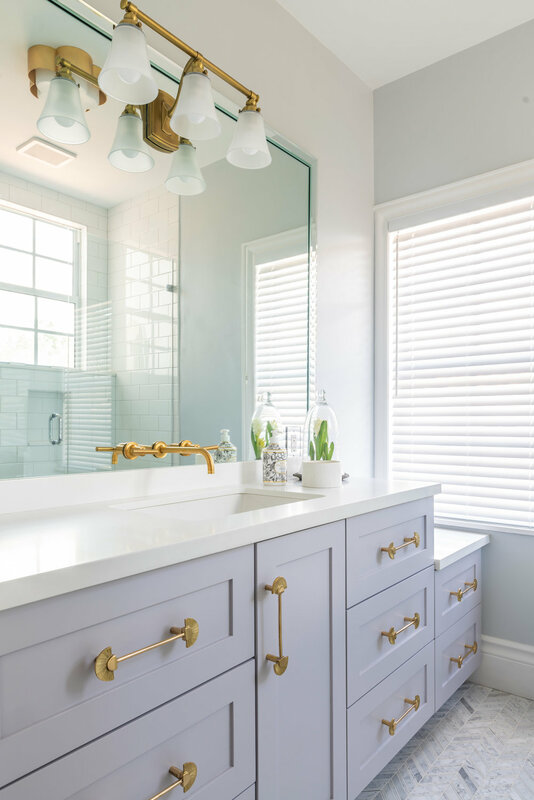 During Phase 1 of the remodel, Laure Nell Interiors gutted the bathrooms and redid the bedrooms, added archways, removed doors, added wallpaper and furnished some of the rooms. Phase 2 will address the living, dining and family rooms, as well as the master bedroom. The exterior is currently being renovated.